Running a business out of your home can be distracting. When your work life and your family life share the same roof, it can be easy for the lines to blur. Lunch breaks become tidy-the-house breaks, downtime becomes riddled with work interruptions, and multitasking becomes mandatory as you toggle between work and play - around the clock. Some say that working out of your home allows you to enjoy the best of both worlds, but all the juggling can also burn you out. Eventually, the pendulum will swing too far in one direction and you’ll be left feeling frustrated and unsatisfied with the side of your life that is being neglected. 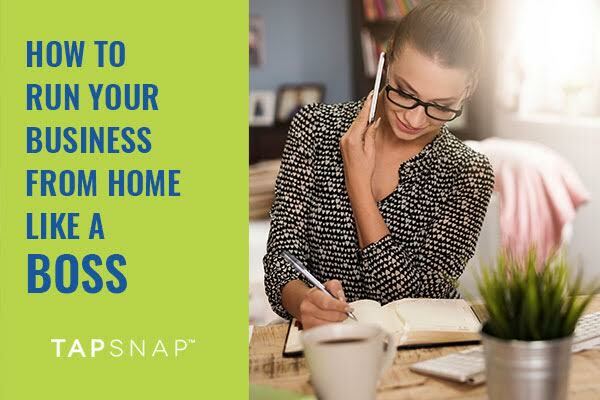 Here are some tips to help you run your business from home like a boss, so you can work more efficiently, and spend less time stressing out. 1) Create a separate work space. It may seem easier to work at your dining room table, or off the side of your kitchen counter, but working amongst your clutter will make it harder for you to stay on task. Set up a desk - ideally in a separate room with a door, but even just a desk in the corner of a room - that is meant only for you and your work, and that forces you to face away from household distractors (such as dishes, laundry, fridge, TV, etc). 2) Schedule time to work. Like an outside office job, it helps to determine your work hours. This will help you to manage your projects and complete them efficiently. Force yourself to focus by clocking in and out of your work day. If you have your desk in a separate room, it may even help to post your office hours on the door so that the other members of the household know when it’s time for you to work, and when you’re available to step away from your desk. 2) Learn when to turn It off. When your work hours are over, close the door, or leave your work space just as you would leave your office to go home at the end of a work day outside of the home. The most difficult part of learning how to ‘turn it off’, is resisting the urge to respond to emails or finish ‘just one more task’. When you step away, you need to truly step away from your work, otherwise you run the risk of making yourself available 24/7. 3) Get Out, Get Connected, Get Inspired. When you work from the confines of your home, it’s easy to become an introvert. While communicating primarily by email is sometimes more convenient, it helps to schedule in-person client meetings and coffee chats. Having face-to-face interactions with adults can be rewarding – both professionally and personally. Take it one step further and join networking groups or workshops that hold regular in-person meetings. Running a business from your home can be a rewarding experience, as long as you maintain control of your work-life balance. If you follow these tips, you’ll be well on your way to running your business - LIKE A BOSS.